We present nine transactions to illustrate how a company's accounting equation stays in balance. When a company records a business transaction, it is not entered into an accounting equation, per se. Rather, transactions are recorded into specific accounts contained in the company's general ledger. Each account is designated as an asset, liability, owner's equity, revenue, expense, gain, or loss account. The general ledger accounts are then used to prepare the balance sheets and income statements throughout the accounting periods. As you can see, ASC's assets increase by $10,000 and so does ASC's owner's equity. As a result, the accounting equation will be in balance. You can interpret the amounts in the accounting equation to mean that ASC has assets of $10,000 and the source of those assets was the owner, J. Ott. 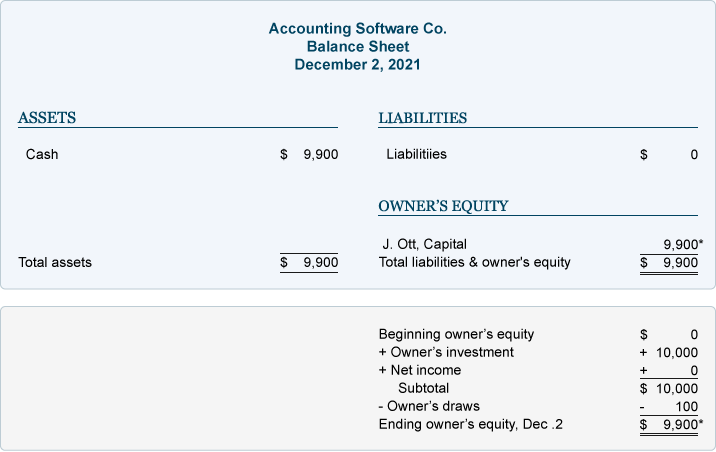 Alternatively, you can view the accounting equation to mean that ASC has assets of $10,000 and there are no claims by creditors (liabilities) against the assets. As a result, the owner has a claim for the remainder or residual of $10,000. The purpose of an income statement is to report revenues and expenses. Since ASC has not yet earned any revenues nor incurred any expenses, there are no transactions to be reported on an income statement. The accounting equation remains in balance since ASC's assets have been reduced by $100 and so has the owner's equity. The totals indicate that ASC has assets of $9,900 and the source of those assets is the owner of the company. You can also conclude that the company has assets or resources of $9,900 and the only claim against those resources is the owner's claim. Withdrawals of company assets by the owner for the owner's personal use are known as "draws." Since draws are not expenses, the transaction is not reported on the company's income statement.